Politicians, educators and social justice leaders are remembering Charles Currie, S.J., a former president of Jesuit universities whose passion for seeking justice in Central America made him a trusted adviser in Washington, D.C., who died on Jan. 4 after a brief illness. He was 88. A chemist by training, Father Currie was president of two Jesuit universities—Wheeling Jesuit University in West Virginia and Xavier University in Cincinnati—and from 1997 to 2011, he headed the Association of Jesuit Colleges and Universities. But he was perhaps best known for his work organizing the response of U.S. Jesuits to the murder of six members of the Society of Jesus, their housekeeper and her daughter in El Salvador by U.S.-backed military forces in 1989. Father Currie pushed for an investigation into the murders and served as a liaison to the U.S. Congress to keep lawmakers informed about the role of the United States in Central America, which is how he met Representative Jim McGovern, a Democrat from Massachusetts who was then an aide to the late Representative Joe Moakley. Describing Father Currie as an “incredible friend,” Mr. McGovern went on to travel with him extensively, including on visits to Colombia, Cuba and El Salvador. Their most recent trip to Central America was in 2016 when they visited El Mozote, where in 1981 the U.S.-backed Salvadoran military killed nearly 1,000 people in one of Latin America’s largest single massacres. Politicians, educators and social justice leaders are remembering Charles Currie, S.J., who died on Jan. 4. Mr. McGovern said that on a previous trip, a group of Salvadorans told a State Department official that what they needed most in their village was a new chapel. The official explained that government funding could not be used for a religious project, but he remembers Father Currie making a mental note of the request and then following up on it when he returned to the United States. “He helped raise the money and built that chapel,” said Mr. McGovern, who will speak at Father Currie’s wake in Washington later this week. “He just never, ever stopped caring,” he said. Alexia Kelley, a close friend to Father Currie who leads the Catholic philanthropy consortium Fadica, called the Jesuit “an incredibly inspiring example and model for the Catholic Christian witness in the public square,” pointing to his efforts on behalf of the poor, both at home and abroad, and his mission of making Jesuit higher education widely accessible, including to refugees. Father Currie was born in Philadelphia in 1930. He entered Fordham University in 1948, where he studied until 1950, when he joined the Jesuits. He earned degrees from Boston College and Weston College and a Ph.D. in physical chemistry from the Catholic University of America in 1961. Two years later, he was ordained a priest. 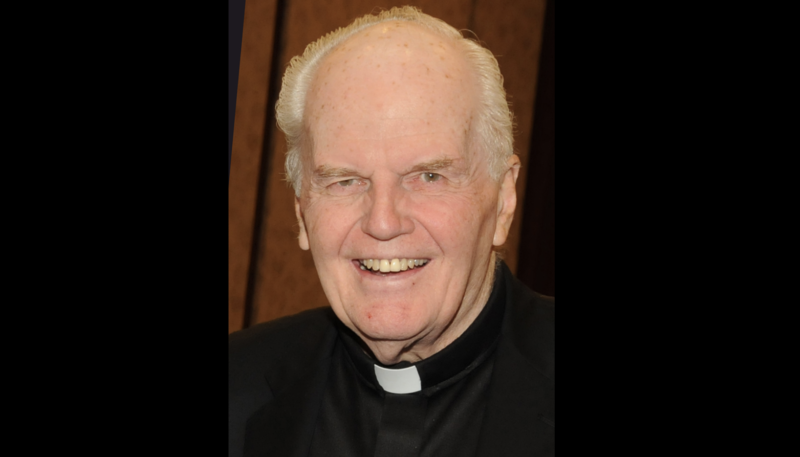 Following Father Currie’s decision to enter the Jesuits, two of his four siblings also joined, Joseph Currie, S.J., a former vice president at Fordham University who passed away in 2017, and Robert Currie, S.J. The three Jesuit brothers spent time together in India, where Father Joe Currie once ministered, and in Nicaragua. Following these visits, Father Charlie Currie returned to the United States and sought to make connections between his vast network in the academic world and those places suffering from extreme poverty. “He was just an extraordinary guy and his world was very large, but he never lost sight that there were lots of suffering people,” Father Rob Currie said. “Father Currie’s advocacy for equal opportunities and economic justice earned him deep love and respect of all,” Speaker of the House Nancy Pelosi said. While at the helm of the A.J.C.U., Father Currie oversaw the development of JesuitNET, a Jesuit distance education network, created the Jesuit Leadership Seminar and coordinated a response to Hurricane Katrina that allowed students from Loyola University New Orleans to spend their fall 2005 semester at sister Jesuit institutions. After he retired from the association in 2011, Father Currie became executive director of Jesuit Commons, an initiative to provide online education to students in refugee camps. The program, now called Jesuit Worldwide Learning, grants diplomas and certificates accredited by two Jesuit universities, Regis University in Denver and Creighton University in Omaha. Father Currie’s commitment to Jesuit higher education included concern that women be elevated to positions of leadership, said Sharon Hirsh, the president of Rosemont College, a Catholic school near Philadelphia. Ms. Hirsh said Father Currie was constantly making introductions that he hoped would help women leaders thrive in their work. Father Currie believed Jesuit education could inspire social change, which led him to gather students of Jesuit colleges and universities near the School of the Americas in Fort Benning, Ga., where members of El Salvador’s military were trained, to learn about the church’s social justice tradition. That experience led to the creation of the Ignatian Family Teach-In, an event that each year brings 2,000 young people from Jesuit high schools, colleges and parishes to Washington to receive social justice training, and to the creation of the Ignatian Solidarity Network. As for Father Currie’s legacy, Mr. McGovern, who described U.S. policy toward El Salvador today as “horrible,” said he hopes to plan a service event in El Salvador in November that coincides with the 30th anniversary of the Jesuit martyrs. He was a really great man. I hope we all learn something from him.